The mirrorlike finish on this Proof Silver American Eagle adds to the beauty of the beloved design. Complete set containing all 29 proof silver eagles in the series (No 1995-W). PCGS encapsulation protects the perfect 70 condition of the coin. Mirrorlike Proof finish adds further beauty with an impressive shine. Weinman's design showing Lady Liberty draped in an American flag, walking gracefully as the sun rises over a ridge. Reverse: A heraldic eagle is shown below 13 small stars, representing the original colonies. Sovereign coin backed by the U. One of the most popular designs ever to grace American coinage, the Silver Eagle combines beauty with collectible value. 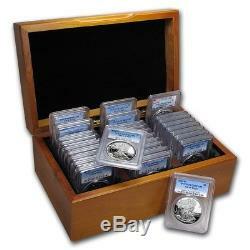 Add this certified Proof Silver Eagle set to your cart today! Each package is fully insured. There are no exceptions to this rule. The UPS Store, or similar third party drop off locations. If you do not receive the package directly from the common carrier, you agree to take all reasonable actions to assist in recovery of the package, including but not limited to filling out reports (and/or police reports) and providing all information needed or that may be requested to assist in recovery of the package. We may ask you to file a police report if it appears loss is due to theft or tampering. Your assistance speeds up the investigation and the sooner we complete it, the sooner we can resolve the missing order. If we determine the package is lost or damaged, we file a claim. Failure to fully cooperate will jeopardize coverage that may be provided to you. The term "APMEX" means APMEX, Inc. The term "Bullion" is used to describe (1) Gold, Silver, Platinum or Palladium Coin(s) which closely follow spot prices and have little or no Numismatic value (such as restrikes); and (2) the form in which metal is shaped such as bars, ingots or wafers. The term "Coin(s)" means a stamped piece of metal of a known weight and fineness issued for commerce by a sovereign government. The term "Fair Market Value" means the Fair Market Value of the Product as determined by APMEX, in its reasonable discretion, as of 5:00 p. The term "Numismatic Coin(s)" means a Coin, the price of which depends more in its (their) rarity, condition, dates, and mint marks than on their gold or silver content, if any. The term "Precious Metal" means Gold, Silver and Platinum along with the Platinum group of elements: rhodium, osmium, ruthenium, Palladium and iridium. Precious Metals are characteristically lustrous, ductile, rare and nonreactive. You shall execute and deliver such other documents and take such other actions as may be reasonably requested by APMEX to carry out your obligations under these T&C. Except as otherwise provided herein, all notices and other communications to APMEX shall be directed to APMEX, c/o Chief Financial Officer, 226 Dean A. McGee Avenue Oklahoma City, OK 73102, and all other notices and other communications to you shall be directed, at the option of APMEX, to the address that you provided to APMEX at the time of your registration. A decision or a failure by APMEX to take action with respect to any non-compliance by you of your obligations to APMEX or to insist upon strict adherence to any term in these T&C, does not affect the ability of APMEX with respect to any other non-compliance by you, and does not waive or limit APMEX's right thereafter to insist upon strict adherence to that or any other term, whether of a similar or dissimilar nature. The section headings are included for ease of reference and do not affect the interpretation or the scope of these T&C. These T&C are intended to be enforceable to the fullest extent permitted by applicable law. If any term of these T&C is held to be unenforceable for any reason, such unenforceability shall not affect the other terms of these T&C, and the term that would otherwise be unenforceable shall be enforced to the fullest extent that it would be enforceable. APMEX may amend these T&C at any time by posting the amended terms on the website, and such amendments shall become effective immediately. If you become aware that you may be required to make any disclosure of such information, including, without limitation, as a result of the receipt of a subpoena or other compulsory process, you shall promptly notify, in writing, APMEX and you shall cooperate, in good faith, with APMEX in obtaining a protective order or other appropriate relief, if any, with respect to such disclosure. The item "1986-2016 30-Coin Proof Silver American Eagle Set PR-70 PCGS SKU #88909" is in sale since Tuesday, October 24, 2017. This item is in the category "Coins & Paper Money\Bullion\Gold\Other Gold Bullion". The seller is "apmex" and is located in United States. This item can be shipped to United States.